Tacita Dean. Photo credit: Fredrik Nilsen Studio. 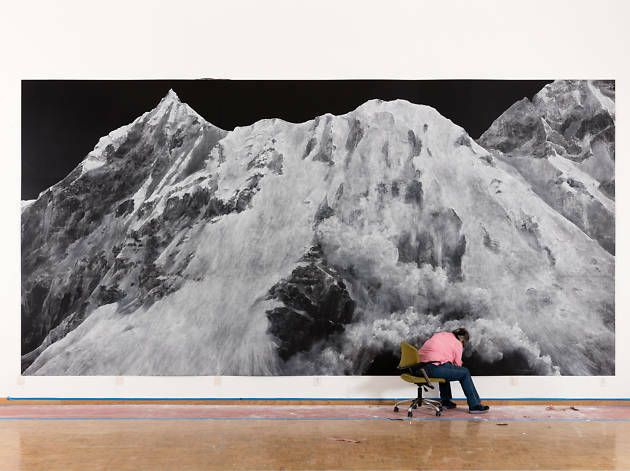 Tacita Dean’s many-headed art beast has sprouted its third and final bonce: after a show of portraiture at the National Portrait Gallery and one of still life at the National Gallery, Dean now opens the doors of the Royal Academy’ new building with a show of landscapes. Lots of the art is gorgeous. There’s an enormous chalk drawing of the mountain where Satan is said to have tempted Jesus, and a huge photogravure that seems to go on forever. They’re imposing, dominating works that are rippled through with fragility and history. Collecting is important to Dean, and displays of rocks and dried four-leaf clovers act as a visual diary of landscapes the artist has experienced. There are some drawings of clouds here too, but meh, they’re drawings of clouds; you can take ’em or leave ’em. The real star is the final piece, a 56-minute video work made of dual films shown at the same time. The two works overlap and clash, half-telling a story about Oedipus and Antigone, half letting Dean train her cameras on epic landscapes. It has a lovely, quiet beauty. It treats the act of creating art as a landscape; it treats life as a landscape; time as a landscape. They’re all things that expand forwards, unfurling and evolving towards an unreachable horizon. It’s confusing, awkward, very long and at points a bit silly, but it’s a very beautiful and stunningly shot work of art. The thing is, if the show was free, or even a cheap, it would be worth seeing. But it’s three rooms of work with a £12 entrance fee… That seems a little steep for what you get. Across London’s three Tacita Dean shows, everything just ends up being spread way too thin. Splitting it apart doesn’t even make that much sense; it’s hard to see what distinguishes this body of work from anything in the other two shows, really. Wouldn’t it have been better to just have one massive Tacita Dean exhibition, a sprawling celebration of her often mesmerising art? Give me a big, steaming hot bucket of Tacita Dean, don’t just spray it about willy nilly and expect me to enjoy it.